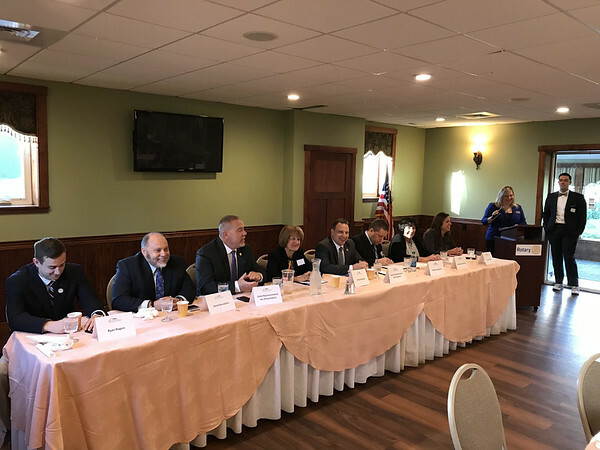 SOUTHINGTON - Candidates outlined their plans for leading Connecticut and made their cases for support at the polls next month on Thursday morning at Back Nine Tavern. The event was sponsored by the Southington Chamber of Commerce. The candidates sat at a long table and were asked questions by moderator Mike Savino. The audience asked questions later. Ryan Rogers, who has served in the U.S. Air Force, said that he wants to stop the state from cutting municipal aid, raising taxes or cutting education. He said the state also needs a long-term budget plan and needs a lower cost of living. Rogers later challenged the idea that Democrats could not be fiscally conservative, while reiterating his opposition to more municipal aid cuts. Michael Gagliardi said he comes from a small-business family, his father having run an electrical business for 40 years. He said he has seen how the “chaos” in the state affects businesses and says solutions have to come from a political outsider. When asked how he could make Connecticut more attractive to young people, he said he would fight for a “fairer tax base” that would bring in more jobs for people just out of college and reduce the budget deficit. Vicki Nardello said she is running for office because she is tired of partisan gridlock. She said that state legislators keep making the same mistakes by “retreating to their corner” and said she would reach across the aisle and not always go along with the party line. Nardello later argued that Connecticut has to “stop picking winners and losers” and offering benefits to companies threatening to leave. She said the state needed to get health care costs for workers down and align curriculums to the needs of employers. Diane Pagano said she has 25 years of experience in corporate America and finance and care-giving agencies. She said she knows how to tackle budgets as a result of this experience. The state needs good leadership, she said, and legislators can’t always follow what their party wants. She also stressed the value in figuring how trade schools and high schools can better train students to fit the needs of manufacturers. Rob Sampson said he initially ran for office because he was concerned about the direction the state was headed. He said he had seen the state implement many bad policies and he wanted to reduce business regulations and taxes to make the state an easier place to live, work and retire in. Sampson later said that the private sector will fix the debt if it is allowed to. He argued that Republicans should have their chance to lead the state. Joe Aresimowicz called himself a “problem solver.” He said he has seen how investing in urban centers, running paths and bike trails has helped New York and Boston become vibrant communities. He added he helped pull vocational technical schools out from under the jurisdiction of the state Department of Education so that they could partner with local businesses. He also said he had supported a bipartisan budget even when Gov. Dannel Malloy would not. Aresimowicz was questioned by a black woman in the audience who asked what could be done about black people feeling that they are being pushed away from Berlin by high-end developments that they can’t afford. Gale Mastrofrancesco has served on the Wolcott Town Council since 2009 and has been vice chairwoman for the past seven years, while also serving on the Finance Council. She said she will advocate for fiscal responsibility and lower taxes. She later answered the same question that Aresimowicz did. Posted in New Britain Herald, Southington Herald, State on Thursday, 18 October 2018 21:10. Updated: Thursday, 18 October 2018 21:12.